Lens Description: The Horseman 65mm f/4.5 Grandagon-N Lens is a Rodenstock 65mm f/4.5 Grandagon-N with a standard Copal #0 shutter, but built into a Horseman-specific helical focusing mount and barrel assembly made to fit upon their SW612/SW612 Professional medium format cameras. 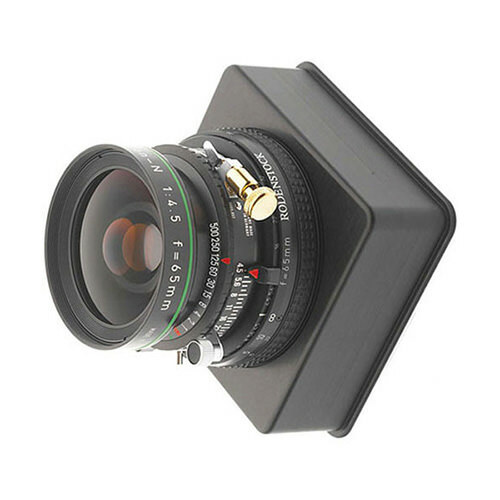 Used with a 6x12 film back, this lens produces a moderately wide 81° x 47° field of view, and upon the 612 cameras the helicoid focusing mount allows a minimum focusing distance of 2.3\' (0.7m). Generous amounts of shift are also permitted (only on the 612 Professional).